Carte de la Palestine ou Terre Sainte. 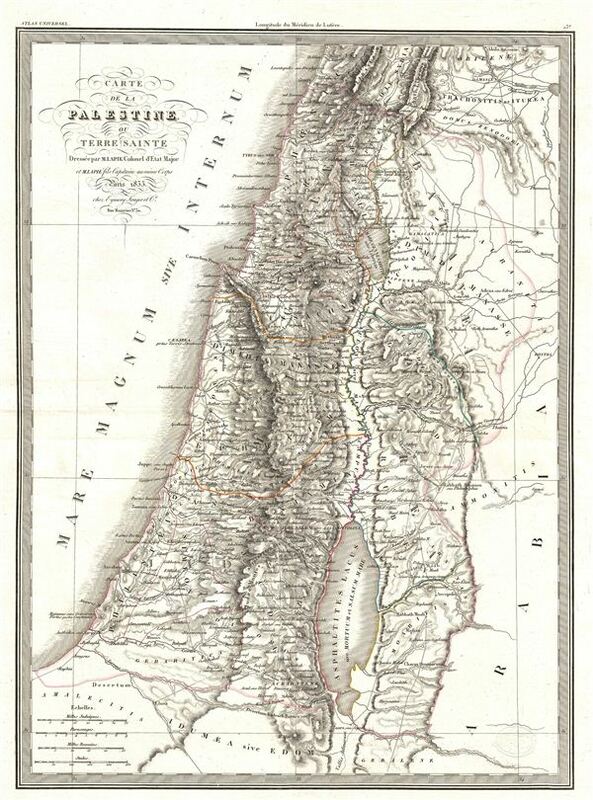 A fine first edition example of M. Lapie's 1829 map of the Israel, the Holy Land, or Palestine. This beautifully engraved map covers from the Mediterranean to Bostra and from Heldua (Lebanon) south to edom, inclusive of all of modern day Israel and Palestine, as well as parts of Syria, Jordan, and Lebanon. Lapie's map offers fine detail throughout with elevation rendered by hachure and political boundaries demarcated with outline hand color. A stunning map, this example offers typical French decorative elements including elaborate typesetting in the title area. essentially a historical map, this chart is designed to illustrate the Biblical landscape at various points in history, with early Latin place names set side by side with transliterated Arabic, Hebrew, and Biblical names. engraved by Armand Joseph Lallemand as plate no. 13 in the first edition of M. Lapie's important Atlas Universel. This map, like all maps from the Atlas Universel features an embossed stamp from the Lapie firm.